A Mercedes-Benz E 300 BlueTEC HYBRID has traveled 1, 968 kilometers (1, 222.8 miles) from Tangier in North Africa to Goodwood in England on a single tank. Mercedes added on reaching its destination, the vehicle still had enough fuel left for another 160 kilometers (99.5 miles). British journalist Andrew Frankel answered this question by conducting a very challenging experiment of his own. He and his co-driver set off from Tangier in Morocco in a standard E 300 BlueTEC HYBRID, crossed through Spain and France and reached their destination in Goodwood in England after driving for 27 hours. On arrival the speedometer showed that a distance of 1968 kilometers (1, 222.8 miles) had been covered. The total range of the hybrid vehicle, which is available as an option with an 80 liters diesel tank, can therefore reach 2129 kilometers (1, 322.89 miles). Admittedly, said Mercedes, on their journey across two continents, four countries and through three time zones, the adventurous journalist and his companion made sure that they adopted a fuel-efficient driving style, however at times their progress was made difficult by heavy rain, high temperatures, big differences in altitude and also heavy rush-hour traffic. Nevertheless they ultimately posted an average consumption of 3.8 liters of diesel per 100 kilometers, or 61.89 U.S. mpg. 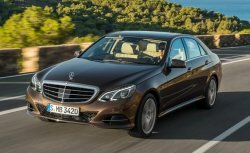 Mercedes added despite its frugal use of fuel, the Mercedes-Benz E 300 BlueTEC HYBRID boasts spirited driving pleasure. Its 204 horsepower four-cylinder diesel engine, combined with a 27 horsepower electric motor, accelerates the sedan from a standing start to 100 km/h (62 mph) in 7.1 seconds.